Viktoria Spaiser, Kate Scott, Anne Owen and Robert Holland, International Journal of Sustainable Development and World Ecology. 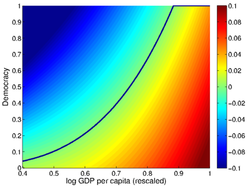 In 2017 the paper ‘The Sustainable Development Oxymoron: Quantifying and Modelling the Incompatibility of Sustainable Development Goals’ was published, showing that there is a conflict between socio-economic development goals and ecological sustainability goals using cross-country time-series data. The authors looked at production-based CO2 emissions to measure and model the 13th SDG goal addressing climate change. Their models showed that production-based CO2 emissions were stalling or even decreasing in rich countries, which suggests that other countries are also likely to see stalling and decrease in their CO2 emissions once they become rich. However, this conclusion can be challenged when accounting for consumption-based CO2 emissions rather than production-based CO2 emissions. In this follow-up paper, we re-run some of the analyses performed in the original paper making use of consumption-based CO2 emissions. The analysis confirms the inherent SDG conflict between socio-economic and ecological SDGs. But, this new analysis demonstrates that from a consumption perspective the trend of stalling or decreasing CO2 emissions is reversed, with natural depletion costs being exported to poorer countries. Despite this new perspective on CO2 emissions, the conflict between SDG goals can still be avoided by making investments in public health, education and renewable energy, as suggested in the original paper. Choice modelling with Gaussian processes in the social sciences: A case study of neighbourhood choice in Stockholm, 2018, Richard P. Mann, Viktoria Spaiser, Lina Hedmann and David J.T. Sumpter, PLoS ONE, 13(11), ​e0206687. We present a non-parametric extension of the conditional logit model, using Gaussian process priors. The conditional logit model is used in quantitative social science for inferring interaction effects between personal features and choice characteristics from observations of individual multinomial decisions, such as where to live, which car to buy or which school to choose. The classic, parametric model presupposes a latent utility function that is a linear combination of choice characteristics and their interactions with personal features. This imposes strong and unrealistic constraints on the form of individuals’ preferences. Extensions using non-linear basis functions derived from the original features can ameliorate this problem but at the cost of high model complexity and increased reliance on the user in model specification. In this paper we develop a non-parametric conditional logit model based on Gaussian process logit models. We demonstrate its application on housing choice data from over 50,000 moving households from the Stockholm area over a two year period to reveal complex homophilic patterns in income, ethnicity and parental status. Advancing sustainability: using smartphones to study environmental behavior in a field-experimental setup, 2018, Viktoria Spaiser, Davide Luzzatti and Aliki Gregoriou, Data Science. Methods, Infrastructure, and Applications, online first publication. ​Ecological sustainability is the defining challenge of our time. Here we suggest a methodological approach that could help to investigate how environmental behavior (transport behavior, energy consumption, food consumption, goods consumption, wasting) dilemmas can be overcome on an individual level in real life by using smartphones to collect daily behavioral data in a field-experimental setup. Previous related studies are reviewed and we discuss how the boundaries of what can be done with smartphones for data collection and experimental purposes can be pushed further to allow for complex behavioral studies. Results from a pilot study are presented to discuss the feasibility and potential of this approach. The pilot shows that studying social dilemma behavior via smartphones is feasible and has potential value as a behavioral intervention tool. 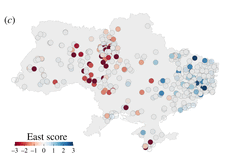 Polarized Ukraine 2014: ​opinion and territorial split demonstrated with the bounded confidence XY model, parametrized by Twitter data, 2018, Maksym Romenskyy, Viktoria Spaiser, Thomas Ihle and Vladimir Lobaskin. Royal Society Open Science, 5,​171935. Multiple countries have recently experienced extreme political polarization, which, in some cases, led to escalation of hate crime, violence and political instability. Besides the much discussed presidential elections in the USA and France, Britain's Brexit vote and Turkish constitutional referendum showed signs of extreme polarization. Among the countries affected, Ukraine faced some of the gravest consequences. In an attempt to understand the mechanisms of these phenomena, we here combine social media analysis with agent-based modelling of opinion dynamics, targeting Ukraine's crisis of 2014. We use Twitter data to quantify changes in the opinion divide and parametrize an extended bounded confidence XY model, which provides a spatio-temporal description of the polarization dynamics. 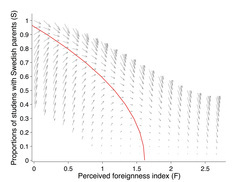 We demonstrate that the level of emotional intensity is a major driving force for polarization that can lead to a spontaneous onset of collective behaviour at a certain degree of homophily and conformity. We find that the critical level of emotional intensity corresponds to a polarization transition, marked by a sudden increase in the degree of involvement and in the opinion bimodality. Identifying Complex Dynamics in Social Systems: A New Methodological Approach Applied to Study School Segregation, 2018, Viktoria Spaiser, Peter Hedström, Shyam Ranganathan, Kim Jansson, Monica K. Nordvik and David J.T. Sumpter. Sociological Methods & Research, 47(2), 103-135. It is widely recognized that segregation processes are often the result of complex nonlinear dynamics. Empirical analyses of complex dynamics are however rare, because there is a lack of appropriate empirical modeling techniques that are capable of capturing complex patterns and nonlinearities. At the same time, we know that many social phenomena display nonlinearities. In this article, we introduce a new modeling tool in order to partly fill this void in the literature. Using data of all secondary schools in Stockholm county during the years 1990 to 2002, we demonstrate how the methodology can be applied to identify complex dynamic patterns like tipping points and multiple phase transitions with respect to segregation. We establish critical thresholds in schools’ ethnic compositions, in general, and in relation to various factors such as school quality and parents’ income, at which the schools are likely to tip and become increasingly segregated. 2017, Viktoria Spaiser, Thomas Chadefaux, Karsten Donnay, Fabian Russmann and Dirk Helbing. Journal of Information Technology & Politics 14(2), 132-153. ​The Sustainable Development Oxymoron: Quantifying and Modelling the Incompatibility of Sustainable Development Goals. 2017, Viktoria Spaiser, Shyam Ranganathan, Ranjula Bali Swain and David J.T. Sumpter. International Journal of Sustainable Development & World Ecology, 24(6), 457-470. In 2015, the UN adopted a new set of Sustainable Development Goals (SDGs) to eradicate poverty, establish socioeconomic inclusion and protect the environment. Critical voices such as the International Council for Science (ICSU), however, have expressed concerns about the potential incompatibility of the SDGs, specifically the incompatibility of socio-economic development and environmental sustainability. In this paper, we test, quantify and model the alleged inconsistency of SDGs. Our analyses show which SDGs are consistent and which are conflicting. We measure the extent of inconsistency and conclude that the SDG agenda will fail as a whole if we continue with business as usual. We further explore the nature of the inconsistencies using dynamical systems models, which reveal that the focus on economic growth and consumption as a means for development underlies the inconsistency. Our models also show that there are factors which can contribute to development (health programmes, government investment in education) on the one hand and ecological sustainability (renewable energy) on the other, without triggering the conflict between incompatible SDGs. Agent-based models and computer simulations are promising tools for studying emergent macro-phenomena. We apply an agent-based approach in combination with data analysis to investigate the human development sequence (HDS) theory developed by Ronald Inglehart and Christian Welzel. Although the HDS theory is supported by correlational evidence, the sequence of economic growth, democracy and emancipation stated by the theory is not entirely consistent with data. We use an agent-based model to make quantitative predictions about several different micro-level mechanisms. Comparison to data allows us to identify important inconsistencies between HDS and the data, and propose revised agent-based models that modify the theory. Our results indicate the importance of elites and economic inequality in explaining the data available on democratisation. 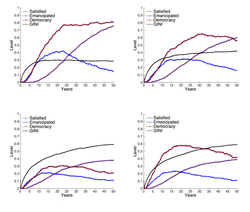 ﻿Understanding Democracy and Development Traps Using a Data-Driven Approach﻿, 2015, Shyam Ranganathan, Stamatios C. Nicolis, Viktoria Spaiser, David J.T. Sumpter. Big Data 3(1), 22-33. Methods from machine learning and data science are becoming increasingly important in the social sciences, providing powerful new ways of identifying statistical relationships in large data sets. However, these relationships do not necessarily offer an understanding of the processes underlying the data. To address this problem, we have developed a method for fitting nonlinear dynamical systems models to data related to social change. Here, we use this method to investigate how countries become trapped at low levels of socioeconomic development. We identify two types of traps. The first is a democracy trap, where countries with low levels of economic growth and/or citizen education fail to develop democracy. The second trap is in terms of cultural values, where countries with low levels of democracy and/or life expectancy fail to develop emancipative values. We show that many key developing countries, including India and Egypt, lie near the border of these development traps, and we investigate the time taken for these nations to transition toward higher democracy and socioeconomic well-being. 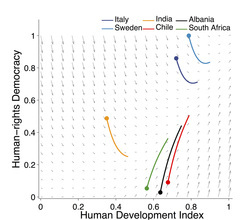 The Dynamics of Democra﻿cy, Development and Cultural Values, 2014, Viktoria Spaiser, Shyam Ranganathan, Richard P. Mann, David J.T. Sumpter. PLoS ONE 9(6). e97856. As PLoS ONE is very slow with responding to our correction request, please find the corrected Supporting Information document here. ﻿﻿﻿Bayesian Dynamical Systems Modelling in the Social Sciences﻿﻿﻿, 2014, Shyam Ranganathan, Viktoria Spaiser, Richard P. Mann, David J.T. Sumpter. PLoS ONE 9(1). e86468.